Rorden Wilkinson argues that the WTO to be transformed into an institution and a form of trade governance that fulfils its real potential and serves the needs of all. This thought-provoking book is highly recommended for anyone with an interest in global trade, international relations or politics, writes Elaine Kellman. 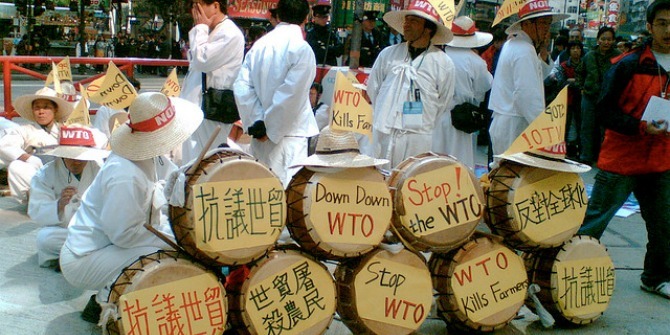 What’s Wrong with the WTO and How to Fix It. Rorden Wilkinson. Polity. 2014. The WTO and its predecessor GATT have been criticized for imposing an asymmetrical global trade regime that predominantly has had a negative impact on developing countries. While this may reflect an asymmetrical world, concerns remain that the effects of the WTO need to be moderated to prevent the consolidation, and in some cases perpetuation, of inequities in opportunities between countries. It is against this backdrop that Rorden Wilkinson’s latest book,What’s Wrong with the WTO and How to Fix It, has emerged. A professor of international political economy, Wilkinson’s previous works on the trade system and governance are extensive. However, in What’s Wrong with the WTO,Wilkinson advances an argument that is seldom heard in debate about the WTO and international trade: that the system should be completely dismantled and rebuilt. Notwithstanding the practicalities of this suggestion, posing the question as to how the WTO should be designed from scratch prompts an interesting debate to the purpose and function of the WTO, both as a stand-alone institution, and contextualized within the global economy. This book is a short accessible read consisting of two sections taking their names from the book’s title. Both sections are sub-divided into three chapters, with each chapter developing a theme to establish and support Wilkinson’s argument: that the international trade system needs to be rebuilt in a way that enables trade-led growth to occur in a manner that offers equity of opportunity for all. Key to Wilkinson’s argument is the premise that inequity in the international trade system between countries at different stages of development has existed since the conception of the current trade system. Wilkinson therefore begins by analysing the existing form of trade governance and asking why it has persisted. He presents an institutional history of the WTO demonstrating how GATT was drafted as a mercantilist instrument that not only reflected the trade requirements of its principal architect, the US, but was crafted to fit around existing US commercial methods, legal frameworks, styles of negotiating and economic ideas – therefore reflecting US ideational, as well as commercial influences. He also demonstrates how throughout the WTO’s history, tactics have been used to directly or indirectly prevent developing countries from competing in the global marketplace or fully participating in the negotiating process. To demonstrate further how asymmetrical outcomes are produced, in Chapter 2 Wilkinson argues that the primary and constitutive principle of the global trade regime’s order iscompetition. He posits that asymmetric bargains have come about because competitive negotiating among unequals has become installed in the machinery of trade governance. In particular, he aptly highlights the unequal status in the economic weight and bargaining capacity of states, demonstrated in the volume and value of trade each state has, as well as by the quality and size of their WTO representation. According to Wilkinson, a natural consequence of the bargaining of unequals is a brand of politics governed by heightened contestation and drama. This point leads to Chapter 3, an unusual chapter which discusses the power and influence of language. Wilkinson argues the language used to discuss trade precludes progressive debate about the WTO and that as a result stories about the WTO are not objective accounts but encase a political purpose. 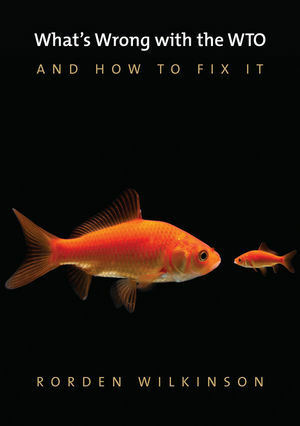 Part Two of the book examines possible solutions. Proposals to reform the WTO are not new, but in Chapter 4, Wilkinson criticizes previous proposals for failing to question the fundamental tenets of the system. He believes that ‘inside-the-box’ thinking perpetuates problems by obscuring the possibility of the WTO delivering equitable outcomes for all, and failing to address the governance of trade through bargains struck between unequals. In Chapter 5, Wilkinson criticizes those who present the WTO’s role as purely technocratic, and calls for a re-orientation of the WTO with the “realization of global social goods as the priority and liberalization and commercial regulation as the machinery”. For Wilkinson, key to the re-imagining of the WTO is a new declaration of the WTO’s aims and objectives that places the realization of trade-led-development-for-all in an environmentally sustainable fashion at the forefront of the purposes of the multilateral trading system – with particular emphasis on helping the least able. For this reviewer, the suggestion that the WTO needs a new declaration of aims and objectives fails to credit the existing objectives delineated within the preambles to the Marrakesh Agreement and GATT. By virtue of Article 31 of the Vienna Convention both these preambles can be used as contextualization for the interpretation of WTO rules. It is clear in these preambles that entering into “reciprocal and mutually advantageous arrangements…” and the “elimination of discriminatory treatment in international commerce” (the reciprocity, MFN and national treatment requirements) are in fact mere methodologiespresented to achieve wider WTO and GATT objectives. In GATT these objectives include raising standards of living and ensuring full employment, while the Marrakesh Agreement goes further, emphasizing the importance of sustainable development (traditionally encompassing social, economic and environmental aspects); the need to protect and preserve the environment; and finally the need for a recognition of different levels of economic development and corresponding needs and concerns (which is possibly indicative of a shift of emphasis towards equity). However, Wilkinson’s proposals go further than a rewriting of the aims and objectives of the WTO, and three other dominant themes emerge: a larger governance or even governmental role for the WTO, that “mov[es] away from states” and focuses on geographical areas and/or people; a means of judging the WTO on its capacity to generate welfare-enhancing opportunities (although it is not clear what indicators it could be judged against); and greater coherence between international bodies generally (encompassing a wholesale reflection on the international economic order). While prompting interesting debate, Wilkinson’s proposals raise serious practical questions. Some of these are addressed briefly in chapter 6, where Wilkinson roadmaps how reform of the WTO could proceed, including: (i) through a conference to re-orientate the design and purpose of the WTO; and (ii) by using negotiating machinery to discuss bite-sized thematic issues (as a few examples: establishing anAid for Trade Fund; up-scaling the technical capacity of the secretariat; and creating a more ‘enabling’ environment for LDCs). Although the practicalities of these proposals are not dwelled on, Wilkinson does conclude with two important caveats recognizing the core difficulties to the achievement of his ideas, any change needs: significant buy-in from WTO membership; and a strong leader. In conclusion, Wilkinson makes a strong argument supporting his call for a rethinking of the purpose and function of the WTO. The book is well written, accessible and Wilkinson’s argument is convincingly presented, in particular in the first half of his book. The second half is a more difficult sell, presenting more radical – and consequently less practical – suggestions for reform. However, at the very least it is a thought-provoking call for debate with two important themes emerging: (i) the need for the WTO to treat social outcomes as a first order concern rather than a second order consequence of market opening; and (ii) the suggestion that competition should not be the main mechanism of governance. Given the existing preambles to GATT and the Marrakesh Agreement (mentioned above), arguably (i) is achievable from within the existing WTO system – which practically offers real possibility of change. In this regard the Dispute Settlement Body of the WTO – not really mentioned by Wilkinson – could have an important role to play. The benefits of (ii) however may be less clear – what are the real alternatives to a competitive system? And, can it really be correct that the WTO is the only institution with competition as its main mechanism of governance when in reality all international institutions face the problem of competing country demands, requirements, politics and expectations? This thought-provoking book is highly recommended for anyone with an interest in global trade, international relations and/or politics. Note: this post originally appeared on the LSE Review of Books. It represents the views of the author and not those of Democratic Audit UK or the LSE. Please read our comments policy before posting. How we diagnose the state of democracy today depends on how we define democracy.